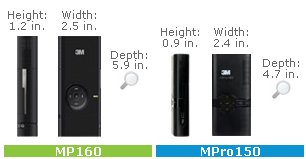 Short version: 3M’s MPro series puts on a little weight! 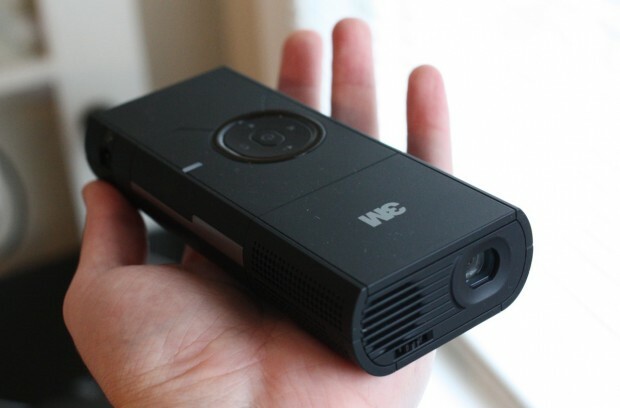 It’s still smaller than a regular projector, but it’s chunkier than every pico projector out there. But it’s also bright and well-built. If you’re not bothered by its girth, this is a great option, though the whole class of devices is still pretty expensive. I’m a fan of the 3M series of pico projectors, it’s no secret. Their best asset is ease of use and a very short-throw image. And I’ve liked their bodies better than the competition from Microvision and Optoma for the most part. The new series sacrifices the compact size of the original series to accommodate a bigger bulb and battery. Is it worth it? Most importantly, the MP160 feels much bulkier, and weighs twice as much. The tripod included is also bigger, giving the whole thing a larger footprint on your desk, coffee table, or whatever. It’s still much smaller than a regular projector, even the most compact ones, and it is still portable, just not so much as before. The image is quite decent. I feel that colors are less vibrant than on the Optomas, but the MP160 has the major advantage of having a shorter throw. With 30 lumens and only about three feet, I can create a very nice 40-inch image. 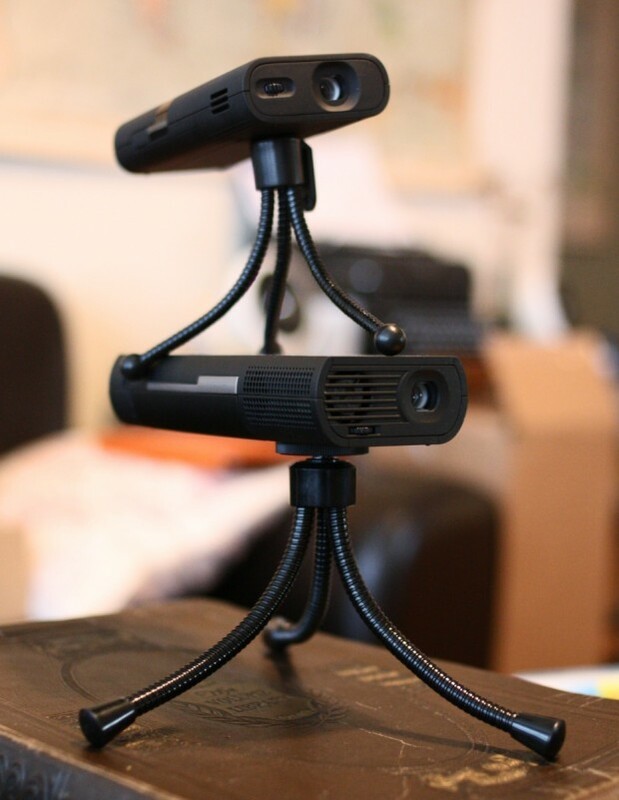 You will need the tripod, and it can be frustrating getting everything just right and adjusting the focus, but that’s common to all pico projectors. Battery life is rated at two hours, which I’d say is about right. If you keep it plugged in, you should be able to watch a movie through it or play games for a while. you can always plug it in while you play. Note to international users: it comes with US, UK, EU, and Australian plug adapters. It also comes with an RCA cable and (thank you, 3M) male-to-female adapters. I had no trouble setting it up to work with a number of devices. At this point in time though I would think that 3M would include an HDMI option. Component is okay, but even small cameras are starting to come with mini-HDMI connectors. 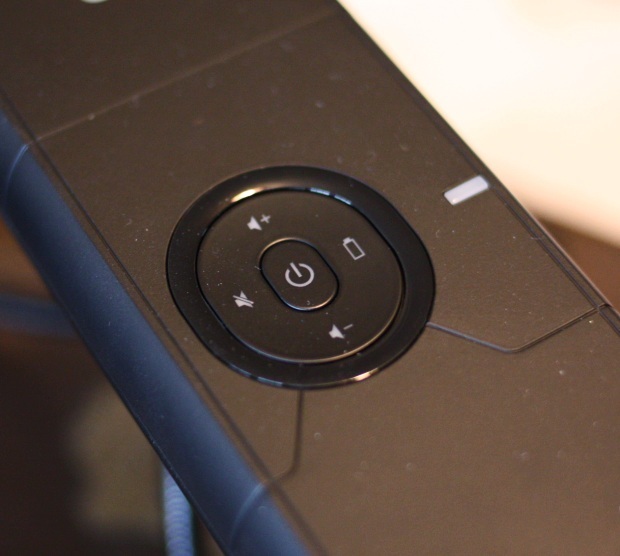 You can also get a direct-to-iPod/iPhone connector separately, which I didn’t get a chance to try out. Operation is dead simple, this version being a simple passthrough for the video input. There are no menus whatsoever, only volume up/down/mute, battery check button, and power. No brightness adjustment or aspect ratio adjustment, which seem like they’d be no-brainers. 3M opted for the ultra-simple approach, which I can appreciate, but a huge amount of content these days is 16:9 or thereabouts, even pictures and presentations. The MP160 is much more effective than its predecessors (and the competition) due to its superior battery life, short throw, and bright image. However, it’s also, as you can see above (next to the petite ShowWX+), big enough that you might consider moving into stationary projector territory with something compact yet full-featured like the Joybee GP1. And for the record, I don’t see much reason to wait for the MP180, since it will cost significantly more and these things don’t have very good format support. The MP160 is still a good option for those who want a compact way of throwing their show or game up on a bedroom wall (unless you like 16:9), and of course the more projectors 3M puts out, the cheaper the perfectly good old models get!